Chef Michael Colletti began building his culinary resume before he even started high school. Coming from a Sicilian family full of restaurant industry professionals, Colletti, a New Jersey native, quickly worked his way from his father’s bagel shop to world-renowned restaurant Le Cirque in New York City. After competing in an episode of “Iron Chef America,” opening two widely popular D.C. restaurants — We, The Pizza and Good Stuff Eatery — and working at a slew of other hot spots, Colletti decided to open a place of his own. Colletti’s VB3, located in Jersey City, NJ, is about to celebrate its fourth year in business, and the busy chef is also working on a new restaurant in Miami. We were recently able to steal a bit of Colletti’s time to talk about his latest venture, his blossoming career, and, of course, brunch. See what he had to say below, and stay tuned for our review of brunch at VB3. How’d you get your start in the restaurant industry? I come from a Sicilian family, so growing up I was always around food. When I was 10 or 11, my father had a bagel place, so I started working there and really enjoyed it. I liked the hustle and bustle. I hated school, so I wanted to try a trade, so I went to culinary school. As soon as I was done, I moved to [New York] City and started working. I just really enjoy cooking. What’s the story behind VB3? When I was working in D.C., I was looking to come back to New Jersey because all my family is there. My cousins that are my business partners, they’ve been in the restaurant business their whole lives also. They have a couple pizzerias that they own. I didn’t realize Jersey City was an up-and-coming area, but they had a space there they were looking at and asked if I would be interested. I was moving back to Jersey anyway, so it just seemed like a good idea. We tried to mix a pizzeria and a lounge, like finer dining. So one side of the restaurant is all grab-and-go pizza for take-out and delivery, and the other side is more upscale. We have a big bar. It’s more of a lounge setting. You have the best of both worlds. I think the area was calling for something like that — a really good pizzeria and somewhere you can go and have a drink and get some really good food. We’re about to come up on our four year anniversary, and the neighborhood has changed a lot. Chefs from NYC are moving out to Jersey City, it’s becoming a dining destination, so it’s cool to be at the forefront of that. What’s it like running a business with your family? You’re always going to fight. Families fight. We all try to stay on the same page [regarding] what’s going to work and what’s best for the business. It’s hard at times because you might want to do something and then your family wants to do it another way. You’ve got to come to a compromise and meet in the middle. That’s the only way you’re going to stay afloat and stay successful. I’ve seen a lot of businesses fail and family members that don’t talk anymore. My cousins, we’re really close. We grew up across the street from each other, so we’re more like brothers. Can you tell us more about the restaurant you’re opening in Miami? I moved down here in July. It used to be a hotel called Haddon Hall. They pretty much gutted it out and redesigned it and made it really nice. [Now] it’s an art-deco style boutique hotel. We’re in charge of all food and beverage. We do beachside food from all over the world. We have some Italian stuff, we have Vietnamese beef salad, we have lobster rolls. We’re also opening up a beer garden next month. It’s going to be more focused on sausages and soft pretzels and stuff like that. 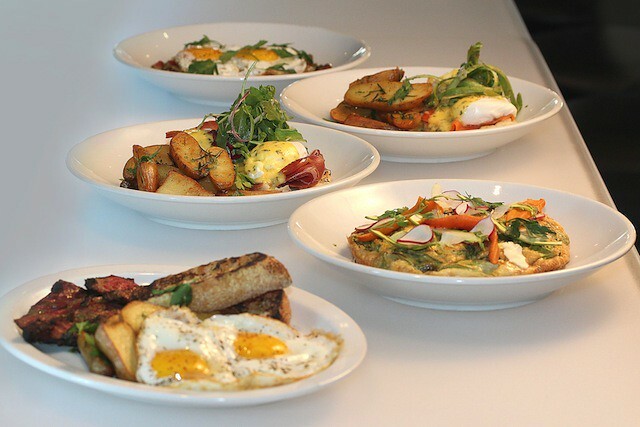 Where is your favorite place to brunch in New Jersey? The Kitchen at Grove Station was a really great place. I don’t know if it’s there anymore. Escape in Montclair is really good. Hoboken’s got a couple great spots. I’m more of like an eat good authentic foods [type of person]. I have an apartment in Union City, and once you step on Bergen Avenue, there’s a lot of Spanish food. I typically stick to eating local and authentic. What is your favorite dish to cook for brunch? I really love corned beef hash. Either that or a Mexican dish. Do you prefer to brunch in or out? It depends. Usually on New Year’s Day, I’ll do a brunch for my friends. We just get together and have fun. I also love not cooking when I don’t have to. Any meal I don’t have to cook is OK with me. What brunch item do you have to order if it’s on the menu? Definitely corned beef hash. I [also] love Mexican food, so if I see something more Mexican influenced, I’ll usually lean toward that. What is your favorite item on VB3’s brunch menu? What is the most-ordered item? 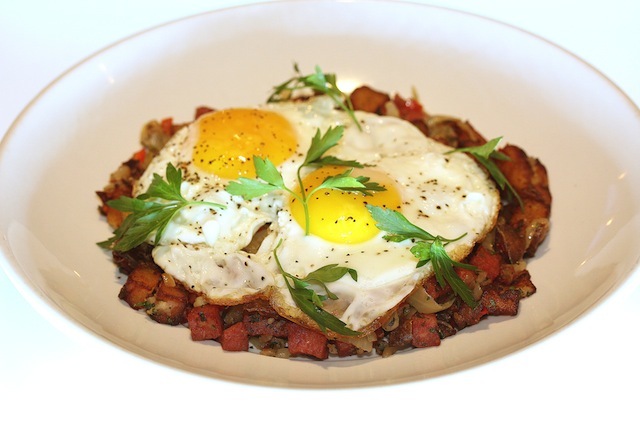 We do a pork roll hash that’s really good. The skillet pancake is really awesome. You can get it with chocolate or seasonal fruit. Those are probably my two favorites. I think a lot of people lean toward over-easy eggs with bacon and toast and potatoes. We do a traditional American breakfast that’s probably one of our more popular items as well as that pork roll hash. Do you prefer Bloody Marys or mimosas? Blood Marys — super spicy. We do an amazing wild mushroom pizza. We do a mushroom sauce instead of a regular sauce. It’s like a mushroom cream that goes on the dough, and we top it with roasted mushrooms, truffles, parmesan reggiano, and thyme. That’s my favorite pizza. We also do really good breakfast pizzas. We put eggs and bacon and potatoes on them. If you could have brunch with anyone, who would you pick? Paul McCartney is the one person I would love to meet and eat brunch with.